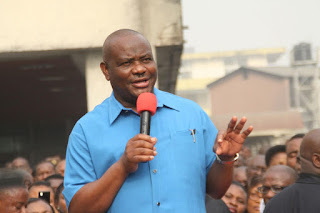 PORT HARCOURT—Governor Nyesom Wike of Rivers State has denied allegation that he had any business link with the current Rivers State Resident Electoral Commissioner, REC, Mr Aniedi Ikoiwak when he was Minister of State for Education. Senator Magnus Abe had alleged recently that the state Independent National Electoral Commission, INEC, boss was a contractor in the ministry when the governor was a Minister, stressing that he should be stopped from conducting the rerun elections. Abe had also accused the REC of allegedly skewing the last rerun elections in favour of the Peoples Democratic Party, PDP, in appreciation to the governor for the alleged contracts he got while Wike was Minister. But reacting, Wike who spoke through the state Commissioner for Information and Communications, Dr Austin Tam-George said that the allegations by the All Progressives Congress, APC, senatorial candidate for the Rivers South East senatorial district, Abe, were tissues of lies, and a clear show of his desperation. His words: “Faced with his imminent defeat in the forthcoming legislative rerun polls in Rivers State, Senator Abe has started a campaign of calumny and vilification against Governor Wike and INEC officials in Rivers State. “Abe’s latest allegation that Governor Wike had a previous business relationship with the current INEC Resident Electoral Commissioner in Rivers State is a grotesque fabrication.